Author: Phillips, Christi Set In . . . 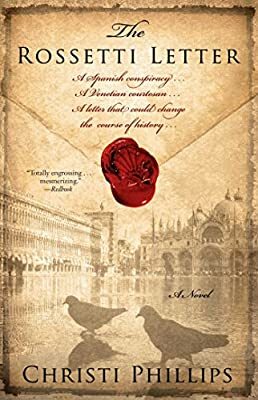 Description: In this captivating debut, Christi Phillips blends fact and fiction, suspense and sensuality into a vibrant, richly imagined novel in which a modern historian uncovers a courtesan's secret role in a shocking conspiracy of seventeenth-century Venice. Layering wit and warmth into her portraits of two very different yet equally dynamic heroines, Christi Phillips shifts effortlessly between past and present in a remarkable novel that is at once a love story, a mystery, and an intriguing historical drama. Filled with beautifully rendered details of one of the world's oldest and most magical cities, The Rossetti Letter marks Phillips's debut as a writer of extraordinary skill and grace.